Thank you again to everyone who came out to NH Open Doors. It was a terrific weekend to be traveling the roads of New Hampshire. We had five studios on our tour and I suspect there will be a lot more next year... so mark your calendar! 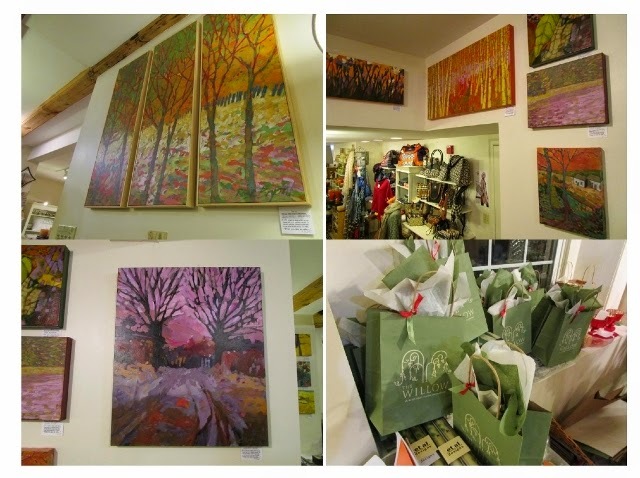 And thank you, too, to the visitors of last Friday's art opening at the Main Street Art Gallery in Newfields. We had a full house at one point and when it thinned a little we cranked up a bit of Karaoke, baby. Gaby Grossman's artwork is luscious with its warm periwinkles and blue-greens. It was a joy collaborating with her. The Newfields gallery volunteers did a fabulous job of hanging the show and putting on the reception... Heather Park-Hanlon, Joe Perna, Deb McLarnon, and Kelley Corson. My recent additions to the Willow Shop walls have gone up. This time the new work involved trees for the subject matter. In the winter all one has to do is look out through a window pane at the bare branches for a perfect beautiful composition. And I like being the recipient of that beauty. It finds its way to my canvas ...sometimes in unexpected colors, but the feeling is still "trees". Mosey down to the Willow as you start your holiday shopping, I would love to know what you think of them. While you are there, check out the series of bird prints by Matt Adrian also known as Mincing Mockingbird. He is one of my favorite bird painters. Join us for a night of COLOR and KARAOKE! 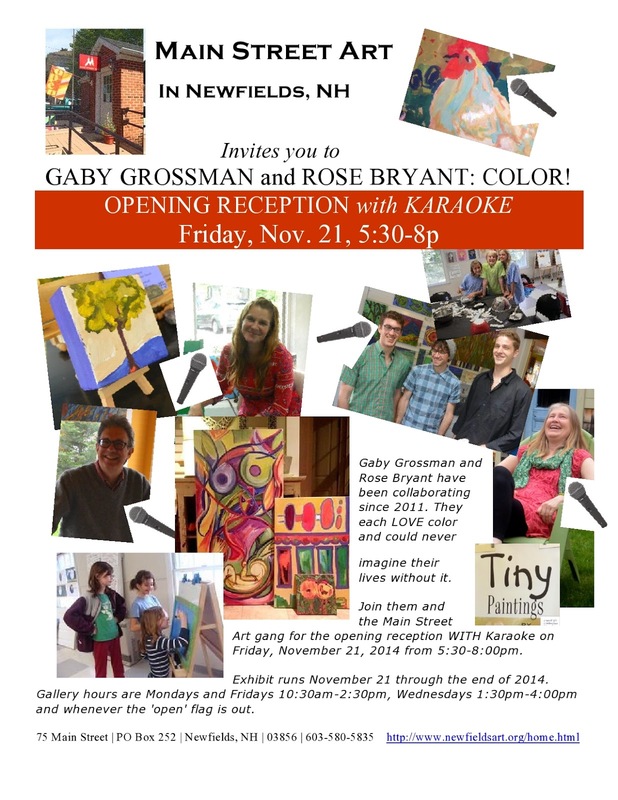 Original paintings by Gaby and Rose at the charming gallery of MAIN STREET ART in Newfields. We will have big art, little art, treats, hot cider, good friends AND Karaoke.... not to be missed :-). 30% of every purchase goes back to Main Street Art programs. Exhibit continues thru December 20. Gallery Hours: Every Monday and Friday 10:30-2:30, Wednesdays 1:30-4:00, and whenever the "OPEN" flag is out! 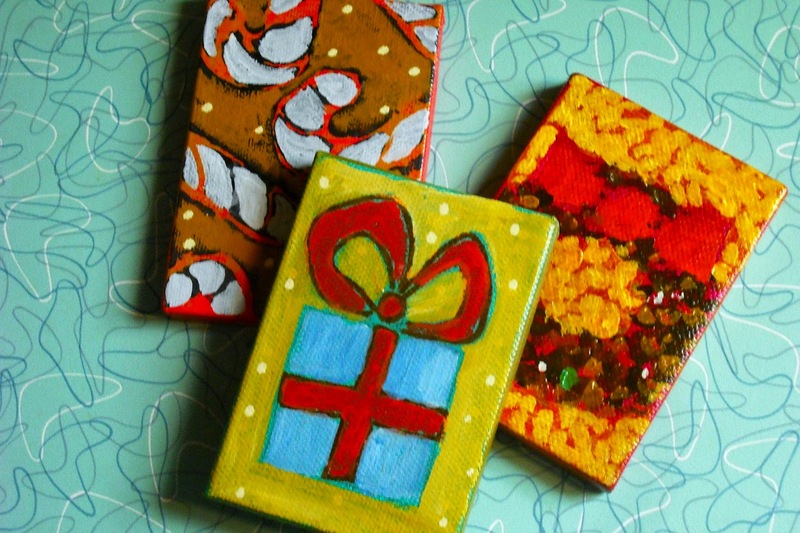 Today and tomorrow, come to my open studio during NH OPEN DOORS and enter to win all three of these little bits of color. No purchase necessary. At the end of the day Sunday, I will draw for the winner. If you are here from out of town, I will ship! Looking forward to seeing all of you... I'll have the fire going, cider on, and Mal will be "catering". I have a couple of projects in the works on the easel, plus I will have all of my cards and art up. 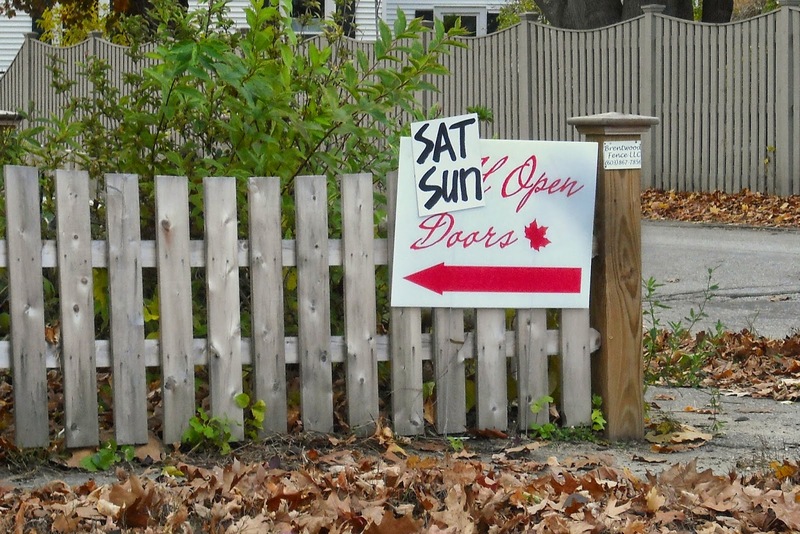 Look for the white signs - "NH Open Doors". Be sure to click and print the big photo (at the bottom) with the listing of all of us participating locally. 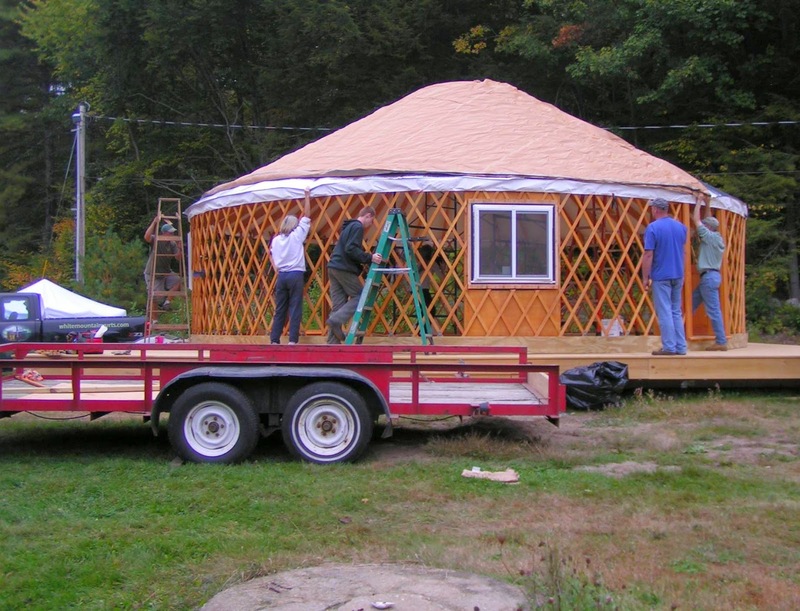 Heather has her yurt (what better conversation than to talk with a yurt owning artist), Lori is at her new office on String Bridge, Don Stone, N.A. 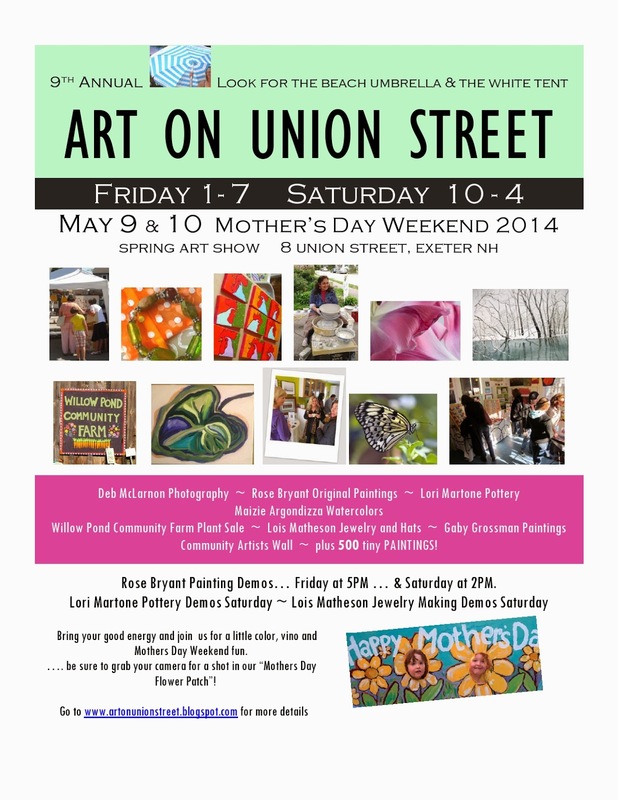 is a stop NOT TO BE MISSED (seriously, an Exeter treasure with a lifetime of beautiful art), and Bruce Jones' studio is a place you will want to live :-). All I can say is, you will be mesmerized by all that is around you. "Under Whitehead" by Don Stone, N.A. I know a few of my closer friends have have heard me mention the art of Don Stone, N.A. I have small images of his work from gallery guides and magazines clipped and stored in my "art file". 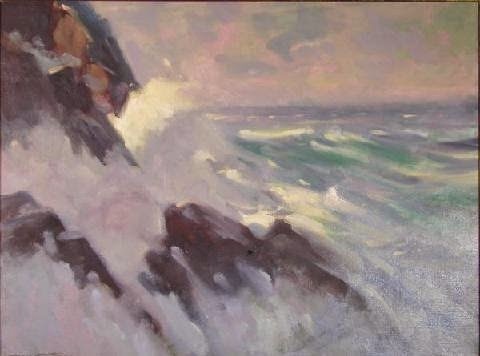 Don maintains a studio on Monhegan Island and in Exeter and resides in Exeter through the winter. I have seen his work for years.... but had never met him. My art friend, Bruce Jones, knows Don well and has painted with him. Bruce and his wife, Tracy, visit Don and Sarah on Monhegan, as well as share time with them in Exeter. When Bruce asked me to participate in NH Open Doors and mentioned that Don would participate as well, I had no idea how rewarding this experience would be. Yesterday I finally met Don and Sarah. Two of the loveliest people you could hope to meet. And his studio, art, and stories could keep you for days. There were large paintings of the sea, rocky shores, water splashing, lobster boats, gulls fleeing.... with blues, lavenders, sea greens... and pops of orange. 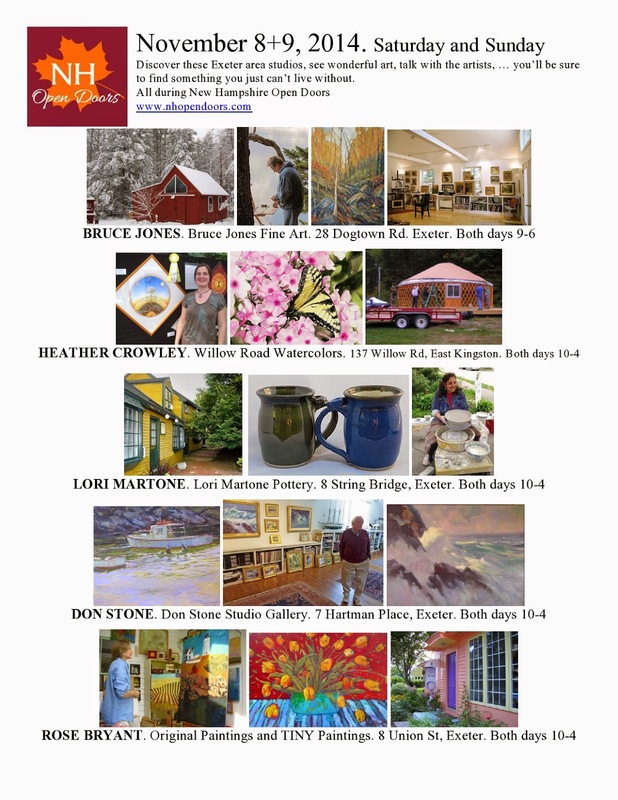 This is one studio you MUST see this weekend if you are in the Seacoast, NH area.... Thank you Don and Sarah for an inspiring visit. And thank you for being a part of our open studio tour. Local studios open this weekend (with pictures). 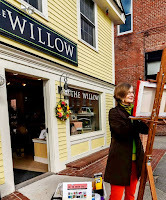 NH Open Doors Seacoast Fine Art and Sugar Tour. Bruce Jones, Don Stone, N.A., Sarah Stone, me at Don's incredible studio. Photo by Tracy Jones. Why are these studio models dancing? They are happy a favorite painting of theirs, "Butternut Landscape", is going to a color-filled home. The orange painting on the wall just past the dancers was seen online by someone who surrounds herself with color... in her home and in her attire. As she came into the studio to view it in person, she spoke about her attraction to color.She didn't have to say a lot... we both agreed - really, how can one not have color around them? To me it is like drinking water. How can one not? And I was intrigued and thrilled when she said the painting is planned for a purple wall in her home. (Sounds. so. delicious.) The amazing thing was how easily she made the decision. She didn't need to take the painting home first... she didn't need to "try it on". As an artist, I am "in it" every day and all the time and to think someone else has that same kind of ease.... well... I LOVE that. Really, I LOVE that. Thank you again, NR. I hope this bit of color keeps your days bright. 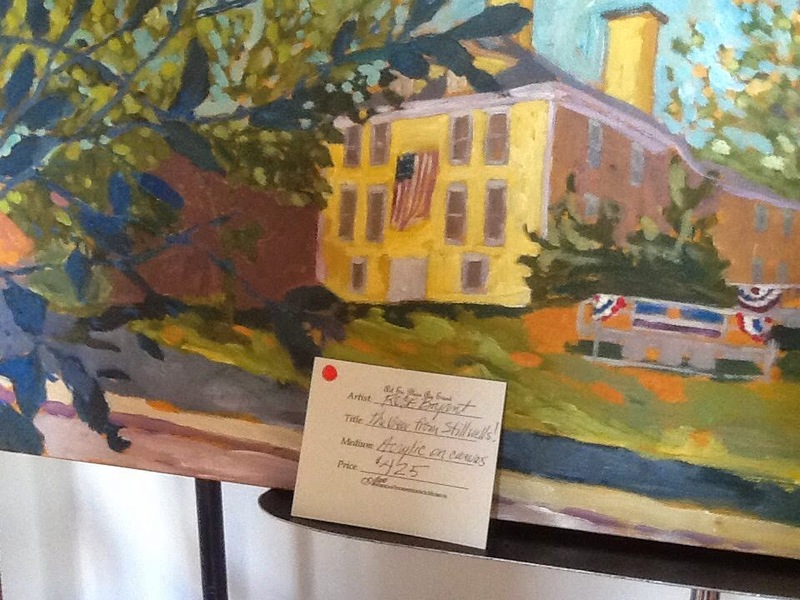 A Process note: The small orange color here is a detail of the painting. The process for this painting was a little different from the rest of my work. The texture is achieved by layering tissue paper and crinkling it within the layers of wet paint. Once the texture is there, I paint the entire canvas and the "veins" with the darker butternut. Then I rub in a lighter creamier butter color between the veins. The last layer over the veins is done by lightly touching the surface of all the veins with a still slightly light butter color. Love the depth it creates... hope you do, too. Colorful things, round things, shiny things, happy things, food things, garden things, little things, big things, Mom day things... we hope to see you here. 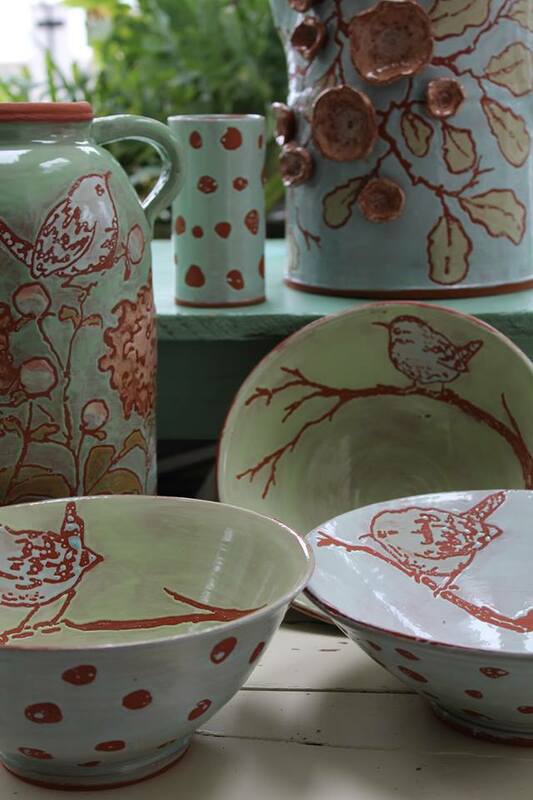 We will have Willow Pond Community Farm, Lori Martone Pottery, Deb McLarnon Photography, Gaby Grossman Paintings (celebrating her first time showing at an art show! 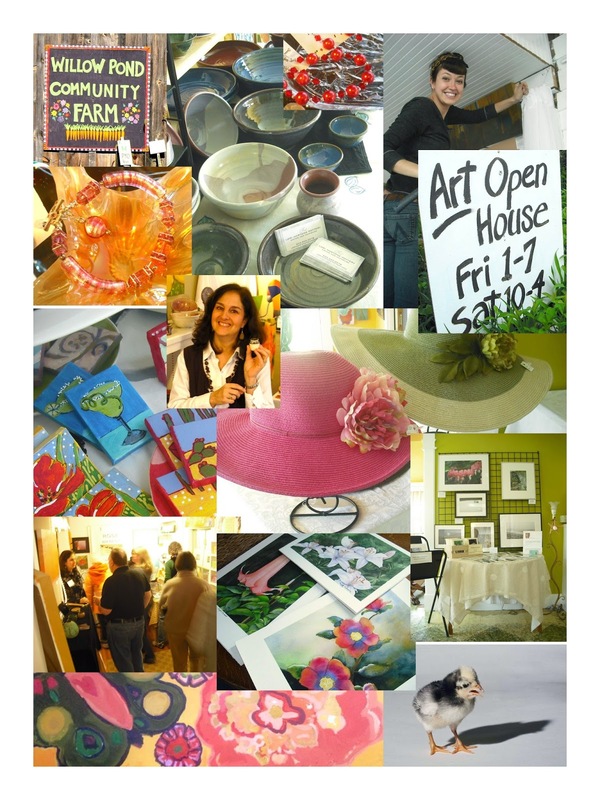 ), Lois Matheson jewelry and hats, Rose Bryant Original Paintings and 500 TINY paintings, Maizie Argondizza Watercolors, Community Artists exhibit, a "Mother's Day Flower Patch" photo-op, art demonstrations, a free painting give-away... plus good friends like you. Hope to see you soon... Friday 1-7 and Saturday 10-4. Click the picture for more information. Have a very Happy Mother's Day! I'm headed to The Hugh Gregg Coastal Conservation Center in Greenland, NH this April 4th, Friday night from 5:30-8:30. Wonderful earthy facility. Lots of artists, lots of good vibes. Click here to see what the facilities look like... and then imagine, the doors wide open, the lights on in the evening, and people walking by the trees up the drive to an art soiree being held to celebrate the environment. 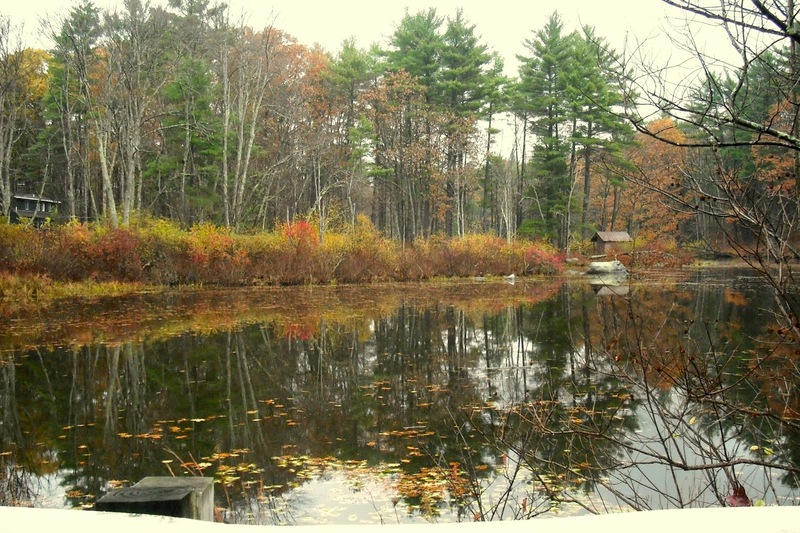 The proceeds from sales at the show go to help protect beautiful Great Bay. So if you are thinking about a good time to buy some art, this might be it. Hope to see you! UPDATE after the show: The show was great so full of art and people! When I arrived at the reception at 5:40, the place was packed... had to wait until late to take a picture with my art (now Laura Byergo's art). Thank you Pam Short (artist) for taking this pic. Thank you to the Great Bay Stewards for a lovely show and to all of the volunteers that handled the work of 60 artists! See you next year. Trust me. I am not only doing this for you :-). I NEEDED to give a gift today.... the weather is starting to affect me (as well as many of my New England friends)! Hopefully, though, this little gift will also brighten Brenda Conroy's day. Congratulations, Brenda! You are the winner of today's noon:thirty give-away! Thank you for "liking" my facebook page and my art. To all of you color lovers, if you want to get in on my future facebook give-aways, "like" Rose Bryant Original Paintings. Ok... it's snowing again.... and when it snows...well. Reminds me of a little family story from the 50's or 60's (that is not the current temperature, by the way). My cousin, Brenda, while expressing frustration to our farming grandfather over eating peas meal after meal was told by my grandfather, "When we have peas in the garden, we eat peas." I see that as a good lesson of resourcefulness artists almost unknowingly and naturally follow. When at the shore, we paint the shore, when in the mountains, we paint the mountains. The snow this winter has been too beautiful to not be influenced by it. The top painting is 24x36... almost finished... I"m still thinking. 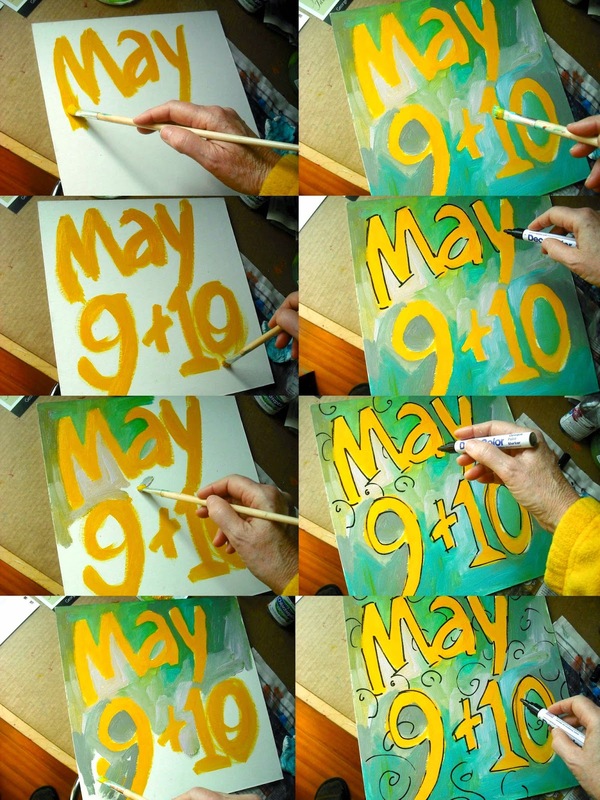 The bottom painting is the same painting but a few days earlier. The under-painting is yellow. The trees were painted in dark green for the composition and structure. Then the blues, creamy light yellows, and whites were added. Hope this helps you to appreciate your "peas". In the meantime, take a look at my video of part of the process. This painting and more will be here at ART on UNION STREET, Friday and Saturday, May 9&10. Rose Bryant original "From the Earth"
I know it will happen... eventually. The earth will again be green (no signs of it yet :-)). This 12x12 original abstract, "From the Earth", $230, is just off the easel and on its way to the Willow in downtown Exeter - a favorite place to find things that entertain the senses. Drop in and take a ... nice ... long ... deep .... breath. Enjoy. Happy Valentines Day. Print, cut and deliver! The snow has calmed, the day has warmed (a little) and there was just a tiny touch of sun. 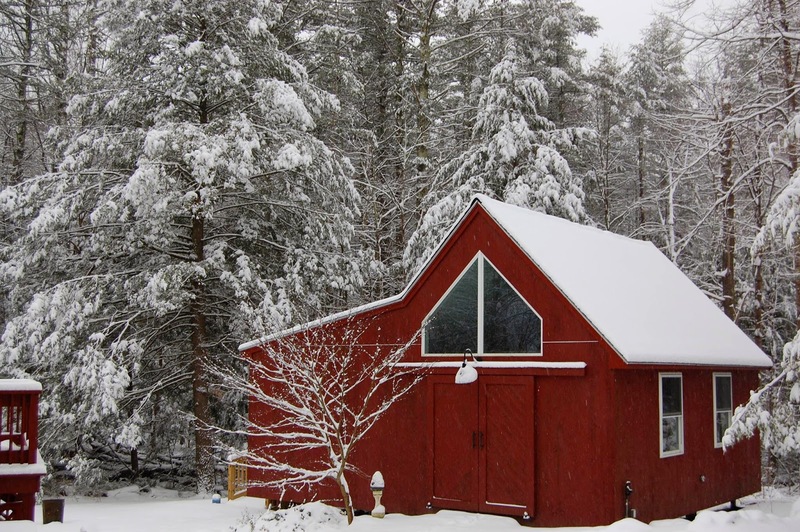 I know this is only a short reprieve here in New Hampshire, but it makes sending Valentine wishes so much better! I hope this little collection of color brightens your day.... feel free to print, cut and deliver :-). Enjoy. On the easel. Sunflowers in the breeze. Yesterday I added blue sky... today I added a few highlights and strokes of paint for atmosphere. See the video of the end of the process. Stay warm and safe everyone! I love the process of filling in backgrounds... especially on a bold under-painting. 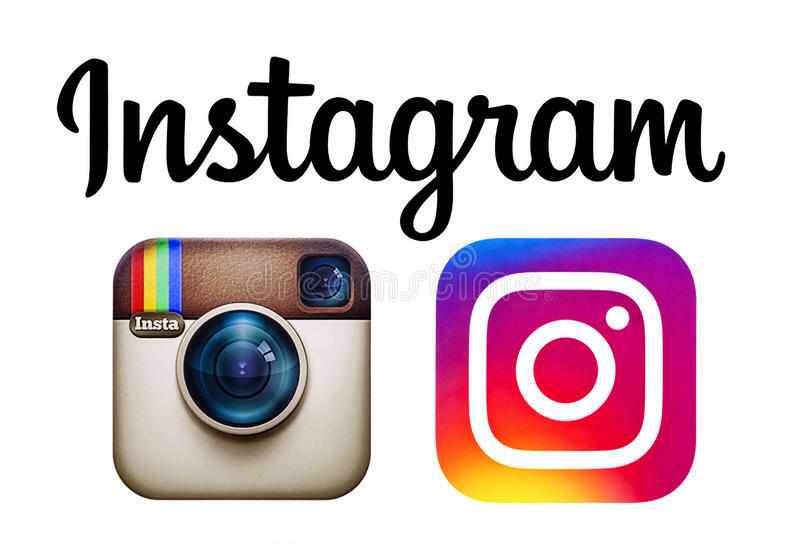 To see some of the progress, click here. Enjoy.